And the pilot food/recipe is the seafood ramyun in Buamdong Revenge Club as cooked by the character Hee-soo! If you haven’t seen Buamdong Revenge Club, I urge you to. In fact, I just reviewed this incredible show yesterday so just trundle over there. In it, Lee Yeo-won’s character Jung-hye is a rich lady who’s never had ramyun before. Waking up hungover at her new friend’s house, her friend’s son prepares seafood ramyun for her and she LOVES it. Loves it so much that she requests it all the time. Watch the clip above and you will salivate. It looks so tasty! So of course I tried and made it for myself too one Saturday lunch while watching Buamdong Revenge Club back in November and here’s the result! Forgive the photo! And if you’ve watched the clip, you’ll actually see how Hee-soo cooked it. I just eyeballed the measurements but in my version, I wasn’t able to buy mussels and I used less squid and shrimp because budget. I love the addition of bean sprouts because it gave a crunch and a different texture to the ramen. And I love how it tastes too! (1) Heat pan and vegatable oil. Saute garlic and gochugaru together. (3) Add in the sliced onions. (5) When the water is boiling, add the ramyun powder and the noodles. (6) Cook noodles to instructions (around 4 minutes). (7) Remove from heat and top with the scallion. (8) Cover the pot and serve immediately! 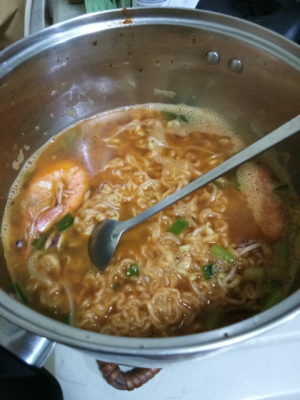 I use shrimp shin ramyun, it taste better for seafood ramyun than the usual spicy one. I add shallot too, it is spicy and taste sweeter than spring onion. I followed BRC recipe before but the squid became too chewy like rubber. So to make the seafood taste better and the garlic, shallot and spring onion less squishy/soggy, I sauteed them along with the seafood in different skillet for about 2-5 minutes and just added them into the soup once the noodle almost done. Boil it again for about a minute, tadaa, it’s done. P.S. I’ll definitely try manohira’s suggestions! Hope you love Hee-soo’s seafood ramyun as much as Jung-hye and I did! How did you make your ramyun seafood-flavored? Admittedly, this recipe hinges on you having the ingredients on hand if ever you crave for it. Don’t beat yourself too hard. *whispers* You can just do it next week. Hahaha! Oooohhh, I must look out for that. I haven’t seen Neoguri or maybe I just don’t know what to look for. Heh. I hope you do end up watching (and enjoying!) Buamdong Social Club! Ready the ingredients because they cook the seafood ramyun at episode 2 and you might crave it right away. Haha!